No experience is necessary to attend any of our Level 1 training courses. Beginners are welcome. The main factor is that you have an interest in your subject (if only in a general sense) and would be prepared to dedicate approximately 4-6 hours study each week in addition to time spent on the training course. After successful completion of a Level 1 course (or on having equivalent qualifications of experience), it is possible to progress to higher level course as indicated in the following table. The above table acts as a guide only. Entry requirements to a particular course may vary according to an individual’s aptitude, experience, qualifications, etc. 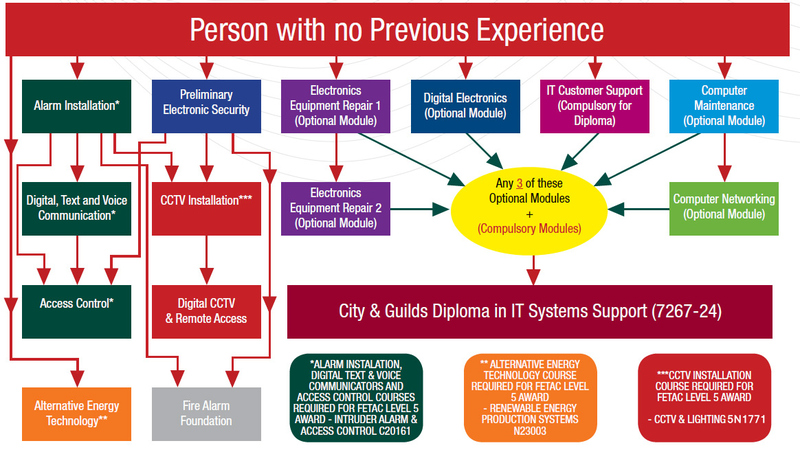 For further information on FETAC/QQI Award Options, please go to our FETAC Award Options Information Page and for further information on City and Guilds Qualifications, please go to our Guilds Diploma in IT Systems Support page.